I Shall Be Released - Kirk Ross / Bob Dylan "Copyright music and lyrics reproduced by kind permission of Special Rider -- for original, exclusive performances by Bob Dylan, check-out the official channel at www.youtube.com/bobdylan." As Tears Go By - The Rolling Stones - Acoustic Guitar Lesson (easy) As requested - An acoustic guitar lesson of my interpretation of the classic Rolling Stones song - As Tears Go By. 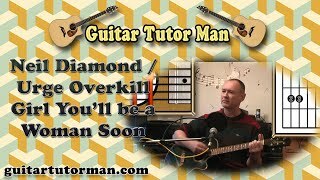 Loads more free lessons can be found at Guitar Tutor Man's official website: http://guitar.freemovies.co.uk where you can also find a song sheet and tab for this video :) Please support my video creation by clicking here: http://www.gofundme.com/guitar-tutor-man :) (You can make this song easier by using an open B chord). (If Paradise is) Half as Nice - Amen Corner - Acoustic Guitar Lesson An acoustic guitar lesson of my interpretation of the classic Amen Corner song - (If Paradise is) Half as Nice. (place a capo on the 5th fret to play in the original key). Loads more free lessons can be found at Guitar Tutor Man's official website: http://guitar.freemovies.co.uk where you can also find a song sheet for this video :) Please support my video creation by clicking here: http://www.gofundme.com/guitar-tutor-man :) (You can make this song easier by using an open B chord). Gimme Shelter - The Rolling Stones - Acoustic Guitar Lesson (easy-ish) An acoustic guitar lesson of my interpretation of the classic Rolling Stones song (using the Stereophonics arrangement) - Gimme Shelter. Loads more free lessons can be found at Guitar Tutor Man's official website: http://guitar.freemovies.co.uk where you can also find a song sheet for this video :) Please support my video creation by clicking here: http://www.gofundme.com/guitar-tutor-man :) (You can make this song easier by using an open B chord). Nowhere Man - The Beatles - Acoustic Guitar Lesson An acoustic guitar lesson of my interpretation of the classic Beatles song - Nowhere Man. Days - The Kinks - Acoustic Guitar Lesson An acoustic guitar lesson of my interpretation of the classic Kinks song - Days. Lady Madonna - The Beatles - Acoustic Guitar Lesson An acoustic guitar lesson of my interpretation of the classic Beatles song - Lady Madonna. Waterloo Sunset - The Kinks - Acoustic Guitar Lesson An acoustic guitar lesson of the classic Kinks song - Waterloo Sunset. So Sad About Us - The Jam / The Who - Acoustic Guitar Lesson An acoustic guitar lesson my interpretation of "So Sad About Us" influenced by The Jam & The Who. Everybody's Talkin' - Harry Nilsson - Guitar Lesson (Strumming) An easy strumming lesson of my interpretation of the Harry Nilsson classic, Everybody's Talkin' from Midnight Cowboy. Daydream - The Lovin' Spoonful - Guitar Lesson (easy) A guitar lesson of my interpretation of "Daydream" by The Lovin' Spoonful. A Groovy Kind Of Love - The Mindbenders / Phil Collins - Guitar Lesson A guitar lesson of my interpretation of A Groovy Kind Of Love influenced by Wayne Fontana & The Mindbenders and Phil Collins. The Long and Winding Road - The Beatles - Guitar Lesson A guitar lesson of the Beatles classic The Long and Winding Road. Norwegian Wood - The Beatles - Guitar Lesson A guitar lesson of my interpretation of The Beatles song Norwegian Wood. Pretty Flamingo - Manfred Mann - Guitar Lesson (easy) A guitar lesson of Manfred Mann's Pretty Flamingo. Brown Eyed Girl - Van Morrison - Guitar Lesson A guitar lesson of my interpretation of Van Morrison's Brown Eyed Girl. performances by Bob Dylan, check-out the official channel at www.youtube.com/bobdylan." Blackbird - The Beatles - Guitar Lesson A Guitar Lesson of my interpretation of the Beatles song Blackbird. Two of Us - The Beatles - Acoustic Guitar Lesson An acoustic guitar lesson of my interpretation of the classic Beatles song - Two of Us. The Urban Spaceman - The Bonzo Dog Doo Dah Band (Neil Innes) - Guitar Lesson (easy) A guitar lesson of my interpretation of the classic Bonzo Dog Doo Dah Band (Neil Innes) song - The Urban Spaceman. Blue Christmas - Elvis - Acoustic Guitar Lesson An acoustic guitar lesson of my interpretation of the classic Elvis song - Blue Christmas. If I Fell - The Beatles - Acoustic Guitar Lesson An acoustic guitar lesson of my interpretation of the classic Beatles song - If I Fell. With A Little Help From My Friends - The Beatles - Acoustic Guitar Lesson An acoustic guitar lesson of my interpretation of the classic Beatles song - With A Little Help From My Friends. I Will - The Beatles - Acoustic Guitar Lesson An acoustic guitar lesson of my interpretation of the classic Beatles song - I Will. Hey Jude - The Beatles - Acoustic Guitar Lesson An acoustic guitar lesson of my interpretation of the classic Beatles song - Hey Jude. The Mighty Quinn - Manfred Mann / Bob Dylan - Acoustic Guitar Lesson (easy) "Copyright music and lyrics reproduced by kind permission of Special Rider -- for original, exclusive performances by Bob Dylan, check-out the official channel at www.youtube.com/bobdylan." An acoustic guitar lesson of my interpretation of the classic Bob Dylan / Manfred Mann song - The Mighty Quinn. Run For Your Life - The Beatles - Acoustic Guitar Lesson An acoustic guitar lesson of my interpretation of the classic Beatles song - Run For Your Life. Help - The Beatles - Acoustic Guitar Lesson An acoustic guitar lesson of my interpretation of the classic Beatles song - Help!. Substitute - The Who - Acoustic Guitar Lesson An acoustic guitar lesson of my interpretation of the classic Who song - Substitute. A guitar lesson of my interpretation of the classic Bob Dylan song - Blowin' In The Wind. Cry Baby Cry - The Beatles - Acoustic Guitar Lesson (easy-ish) An acoustic guitar lesson of my interpretation of the classic Beatles song - Cry Baby Cry. Love Hurts - Everly Brothers / Nazareth / Roy Orbison etc. - Acoustic Guitar Lesson (easy) An acoustic guitar lesson of my interpretation of the classic song - Love Hurts (covered by many including: The Everly Brothers, Nazereth, Roy Orbison and Rod Stewart). Loads more free lessons can be found at Guitar Tutor Man's official website: http://guitar.freemovies.co.uk where you can also find a song sheet for this video. To play in the same key as: The Everly Brothers - detune by 1 fret. Nazereth - standard tuning - no capo. Roy Orbison - capo on 3rd fret. Rod Stewart - capo on 5th fret. 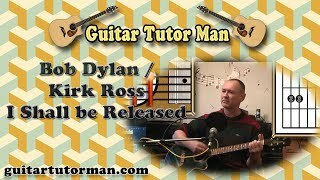 The Times They Are A Changin' - Bob Dylan - Acoustic Guitar Lesson (easy) "Copyright music and lyrics reproduced by kind permission of Special Rider -- for original, exclusive performances by Bob Dylan, check-out the official channel at www.youtube.com/bobdylan."